Franklin was born in Memphis, Tennessee on March 25th, 1942. The daughter of a Baptist minister, she was given singing lessons by Clara Ward and Mahalia Jackson, gospel stars of the time. Originally part of the church’s gospel choir, at the age of 12 her talents were recognized by the award of a soloist’s position. In 1956, she made her first recordings, and for the next four years she concentrated on religious music. However, she moved away from this in 1960 when she signed for Columbia. The label did not showcase her talents to best effect, spreading her across a wide array of genres. Disappointed and upset by these events, Franklin transferred to Atlantic in 1966, and had her first hit early the following year, when “I Never Loved a Man” broke into the top ten. Several outstanding records followed in quick succession, including “Respect,” which would come to be seen as her anthem. Other numbers, including “Baby I Love You” and “Chain of Fools” confirmed that Franklin had what it took to become a major star and brought her the “Queen of Soil” nickname. Although now highly successful, Franklin endured a turbulent period in her private life: her marriage broke down and she had a falling out with her manager. Her music reflected this uncertainty, with some critics believing that she had fallen below her initial very high standards. Nevertheless, songs such as “Think” and a cover of the David/Bacharach song “I Say a Little Prayer” reaffirmed Franklin’s continuing musical ability. By the early 1970’s, her career was back on a more even keel thanks to the likes of “Don’t Play That Song” and “Call Me.” She made a famous live appearance at the Fillmore West in 1971. The roller-coaster of Franklin’s career then took another downward lurch, with the late Seventies seeing her suffer from a succession of uninspired records. It took a cameo appearance in “The Blues Brothers,” a cult musical comedy movie, to bring her back to the forefront of the public’s affections. In 1980 she signed for Arista and clicked back into gear with songs like “Get It Right.” A few years later she recorded a hugely successful duet with Annie Lennox, “Sisters are Doin’ it for Themselves,” and this began another phase of her career. 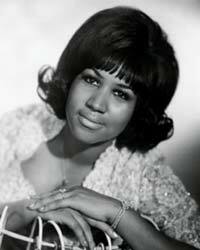 Over the next few years, she sang with Prince, Elton John, Whitney Houston and James Brown. Franklin was once more dogged by criticism as the 1990’s dawned, and she recorded little of note until late in the decade. Partly this was due to an album in which excellent disco tracks such as the Sly Stone-written “Everyday People” rubbed shoulders with mediocre pieces like “What You See is What You Sweat,” and some felt that her career was now undeniably on the slide. However, the critics were confounded by 1998’s “A Rose is Still a Rose” and its 2003 sequel “So Damn Happy,” which brought an end to any talk of retirement. In the early 21st century, Franklin’s reputation is as high as it has ever been.